‘There’s probably not a lot of guys out there who can drive that sort of external financial interest,’ says David Nucifora. Sexton's return to Ireland is believed to have been sealed thanks to private money. THE IRFU SAY that private money is “helpful” as they attempt to keep their best players in Ireland, although Performance Director David Nucifora denies that the union has or will seek out such assistance. 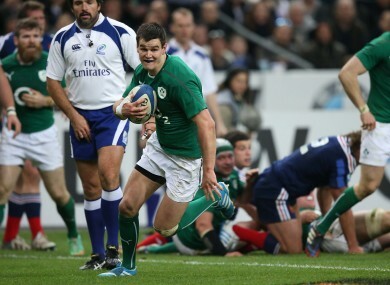 Johnny Sexton’s impending return to Leinster has reportedly been facilitated by his IRFU salary being topped up by billionaire Denis O’Brien, a model that would appear to make sense as French and English clubs continue to grow in wealth. Nucifora points out that only a limited elite group of players will attract outside interest for this type of investment, and stresses that the IRFU must continue to offer their playing staff the best possible professional environment to ward off foreign offers. “Players understand that how they’re treated and the welfare of the player, how they’re managed, is hugely important, because that quickly turns into years on their playing life and their earning capacity,” says Nucifora. So if you can say to player ‘we’ve got a very well-managed system here in this country that will look after you and ultimately put another two, three, four years on your career,’ then they’ll do the maths and quickly convert that into money. I think that comes into the equation for them as well. “Yeah, private money – if they’re good enough to get it – that’s great. It’s helpful, but it’s not the only factor. It’s up to us to make sure that we compete by trying to offer a really good environment here for the players to play. Nucifora, who started as Performance Director in June, stressed that the IRFU have not looked to broker any deals with wealthy individuals in relation to private investment, stating that it is up to the players and their representatives to do so. “It’s not for us,” says Nucifora. “We don’t facilitate or seek to facilitate any of those things. “What we do is we deal with contracting players and if the player has a high enough profile then they will attract their own sponsors. I can’t think that there’s a plethora of them out there who are going to be attracting sponsorship. Poll: Can Munster top Pool 1 of the European Rugby Champions Cup? Email “IRFU admit private money is 'helpful' but deny seeking out investors”. Feedback on “IRFU admit private money is 'helpful' but deny seeking out investors”.